The Panini album of the Copa America appears in 2007 for the edition held in Venezuela. Quality of the album is excellent with thick cover and pages, whereas the stickers are not very attractive, they have a small size and not high definition. Moreover, even if the cover states "Official Licensed Sticker Album" there are no logos of the federation in the inside of the album: logo stickers are replaced by flags and player sticker are cut so that no shirt is visible, only the face. The album opens with the contents on the left and the Roll of Honour on the right page, which includes the first four stickers: the Copa America 2007 logo (two shining stickers), the mascot, and the logo of the South American Football Confederation. The album continues with two pages about the history of the previous edition (Peru 2004) won by Brazil. In this section there are a total of 12 stickers: 10 action stickers of the final Argentina-Brazil and two shining stickers of Brazil celebrating. The 12 teams are then shown divided by groups. Each team has 21 stickers: one shining flag sticker and 20 player stickers. Curiously, Chile has also 21 stickers but no individual player stickers. Instead, there are two big team photo puzzles (one composed by 9 stickers and the other by 3 stickers), two supporters puzzles (one composed by three stickers and the other by two), the shining flag, the federation logo, the first jersey, and the second jersey. Another particularity of this collection is that the team Mexico was not included in the packets (only the flag sticker), but it was instead delivered in a separate sheet with 20 stickers of players. After the teams, there is a section about the history of the Copa America. On four pages there are 30 stickers of team photos of most of the winners of Copa America, since its first edition of 1916. The first sticker (Uruguay 1916) is shining. Last section of the album is the programme of the competition. 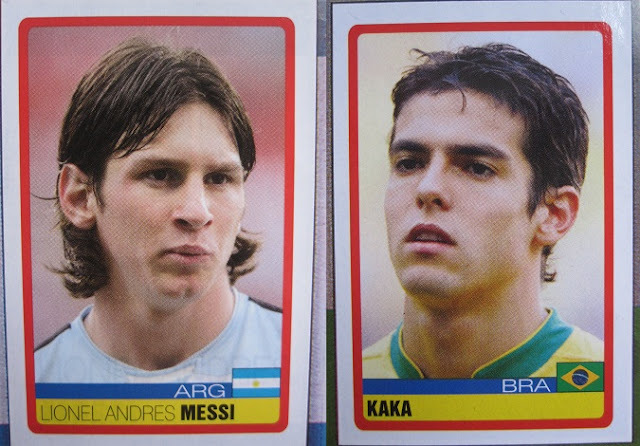 In this page there are also two shining stickers to compose the trophy Copa America 2007.